Summer hit and we aren’t following a school routine, so it has taken us a couple weeks to make a few rainbow projects happen. Most of our adventures seem to involve food, art and books! 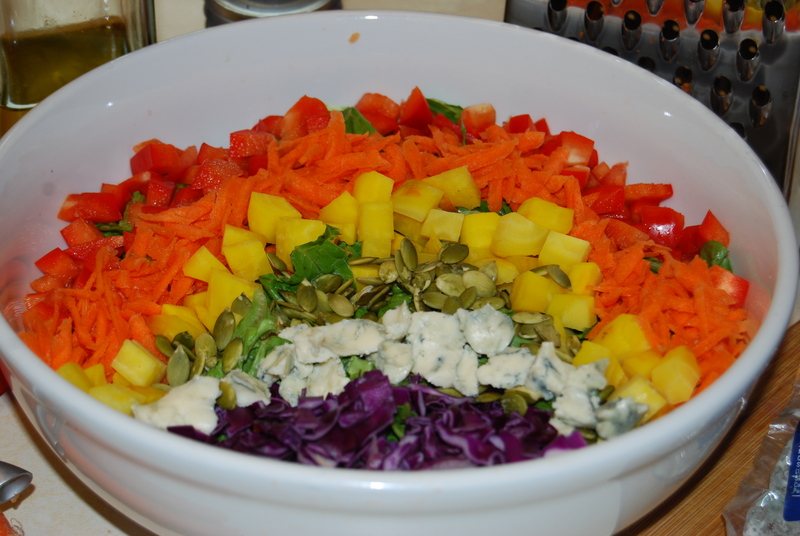 We made a Rainbow Salad for supper one night; the whole thing was delicious! 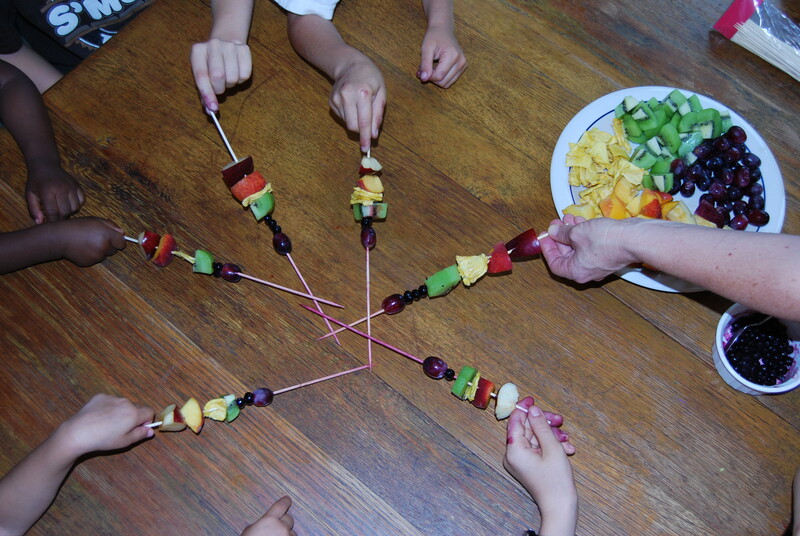 Rainbow Fruit Kebabs were a fun addition to our Sunday supper snack one evening. 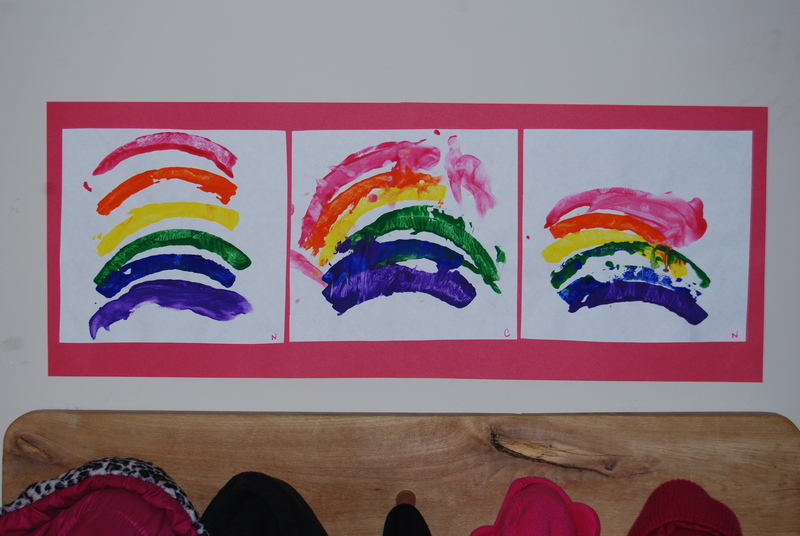 If you need rainbow craft ideas, check here and here. Both sites have lots of incredible ideas. 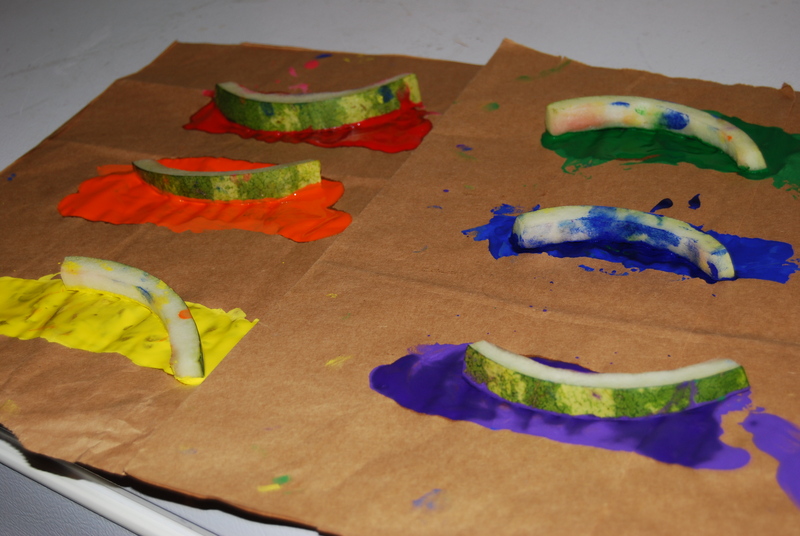 We (I) chose a simple painting project that repurposed the watermelon (rinds) we enjoyed on Father’s Day! (I trimmed the bite marks off so we could have pretty, even arcs.) Since I buy paint in large squeeze containers I’m always looking for something to dispense it onto for use in projects. I cut open a thick paper bag to use this time. I really like the finished result. They make a good replacement for the faded poinsettias that were still over the coat pegs until earlier this week! We do need different red paint though . . . our new bottle dries pink! BOOKS – These are in no particular order and represent a huge variety of ways to explore and enjoy God’s amazing colors. I find new ones each time I go to the library, so the list has gotten rather long. 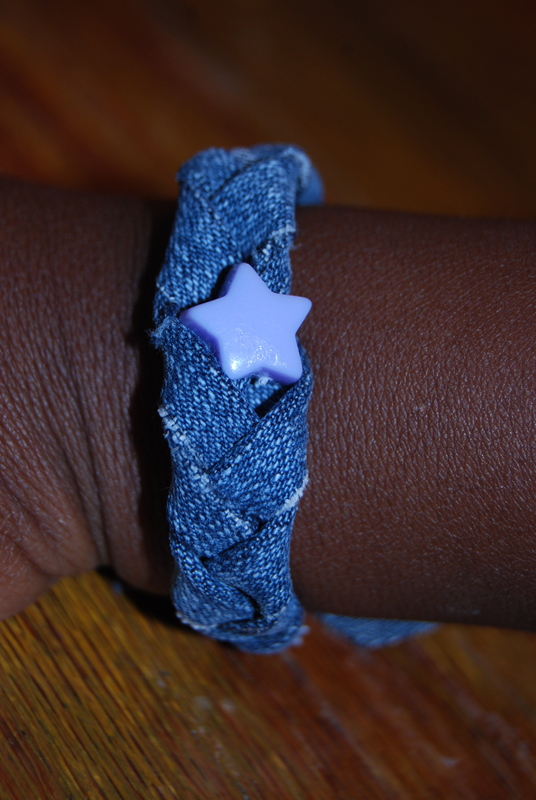 Our favorites are starred. **Red-Yellow-Blue: Colors in Art by Silke Vry A fascinating history of color in art with interactive projects and puzzles. **Growing Colors by Bruce McMillan Vibrant pictures of fruits or vegetables on their own and as they grow. 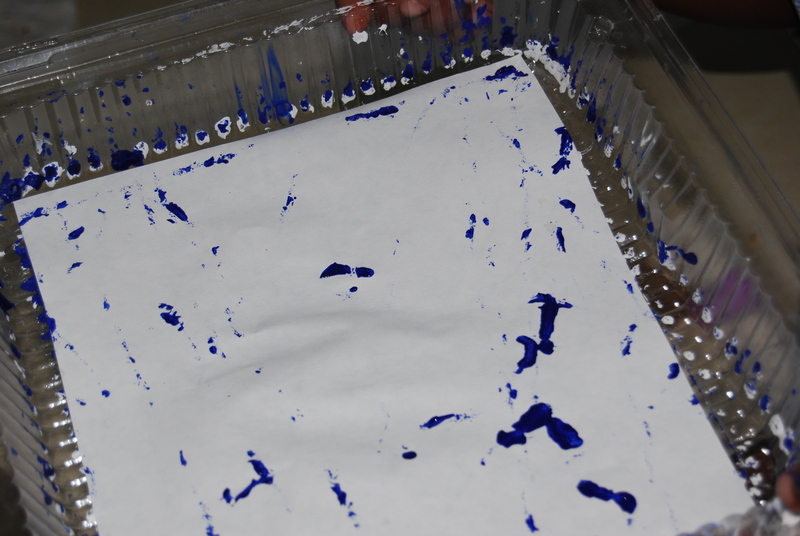 Color by Ellen Lawrence Fun, simple experiments for experiencing color. Light and Color by Malcolm Dixon and Karen Smith Explores the science of light and color with short explanations and projects. A Color of His Own by Leo Lionni A chameleon explores colors while trying to figure out which one identifies. Yellow Elephant: A Bright Bestiary by Julie Larios illustrated by Julie Paschkis Bright illustrations of animals accompany poems about animals in imaginative and realistic colors. **Kitten Red Yellow Blue by Peter Catalanotto Mrs. Tuttle keeps track of each kitten by the colored collar it wears. The colors correspond to the profession of the person to whom the kitten belongs. Red Green Blue by Alison Jay Colors are seen and illustrated by common nursery rhymes though the rhymes themselves aren’t printed in the book. Red Sings from Treetops by Joyce Sidman A unique exploration of how various colors are experienced throughout the year. Patrick Paints a Picture by Saviour Pirotta Patrick learns to what colors to mix together to create other colors while painting a picture with his aunt. Marcos Colors by Tomie dePaola Simple board book to introduce names of colors in Spanish. **Mouse Paint by Ellen Stoll Walsh A fun color mixing book. All the Colors of the Earth by Sheila Hamanaka Not rainbow colors, but we still celebrate them everyday. The Deep Blue Sea by Audrey Wood Each page of the story adds a new color until a rainbow appears at the end. My Color Friends – I haven’t gotten to see any of these in person yet, but they look like fun. A family who travels the world has put together some books that illustrate individual colors with photographs they’ve taken during their travels. The books are available on Kindle and in print. Here is a week long unit study based on Margaret Wise Brown’s The Color Kittens from DerivingMommyhood. I was surprised and disappointed that our library did not have this book. I like the absorption color wheel idea. 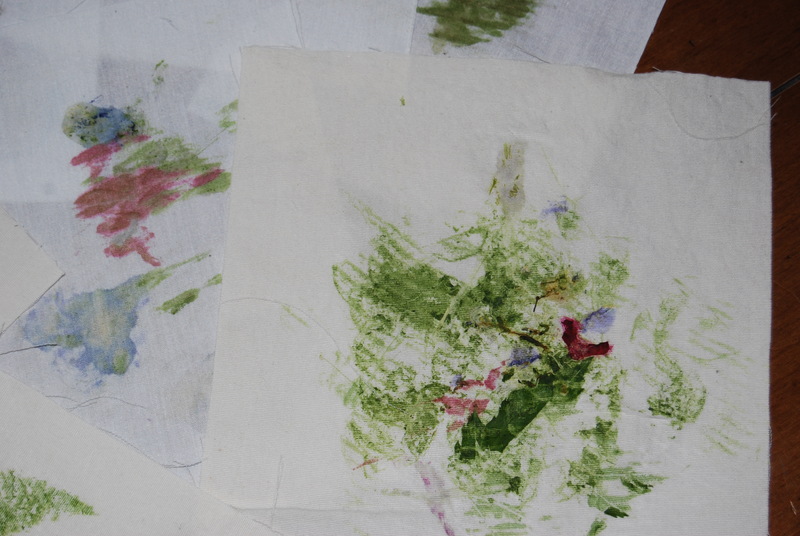 I hope to adventure into color mixing with the little ones in the next couple weeks. Categories: Homeschool, Preschool, Reviews | Permalink. 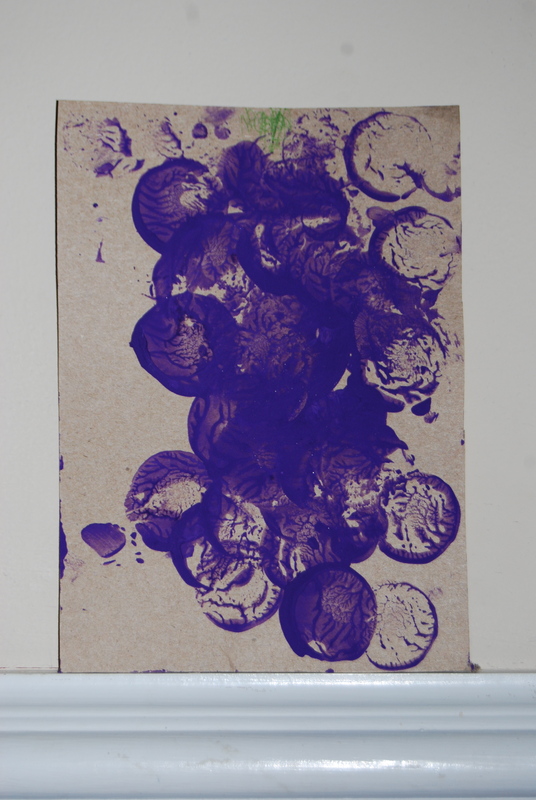 We had a few grapes and bought some eggplant. The kids’ favorite eggplant dish is Moussaka, but this time we made some Ratatouille in the crockpot. We couldn’t find any purple peppers and no plums are available this time of year. 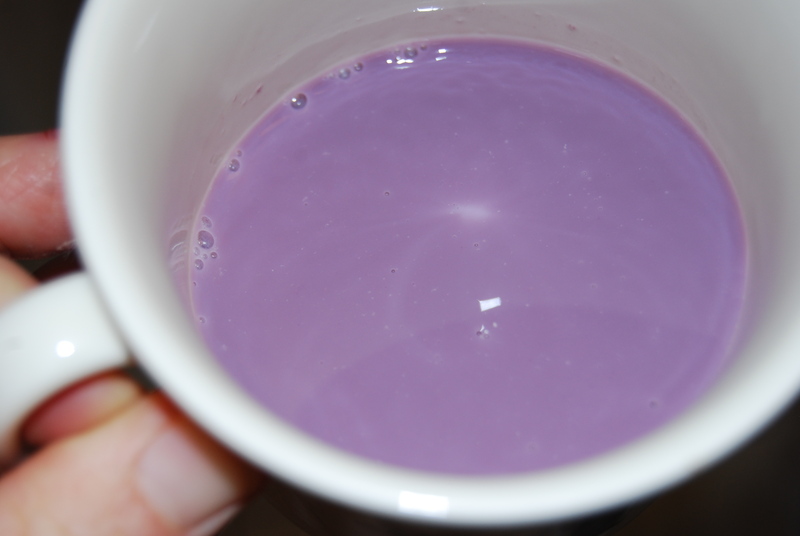 We did try making Purple Cows – a combination of concord grape juice and milk! 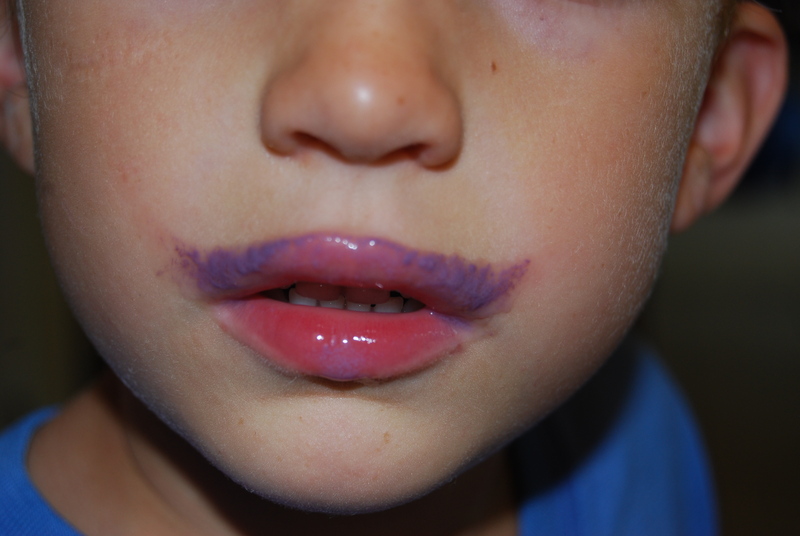 Andrew decided that the purple mustache was cool, but the drink itself wasn’t that good. Maybe it would have been more of a hit if I’d made it with ice cream. PURPLE BOOKS – we didn’t have one purple book on our own shelves! 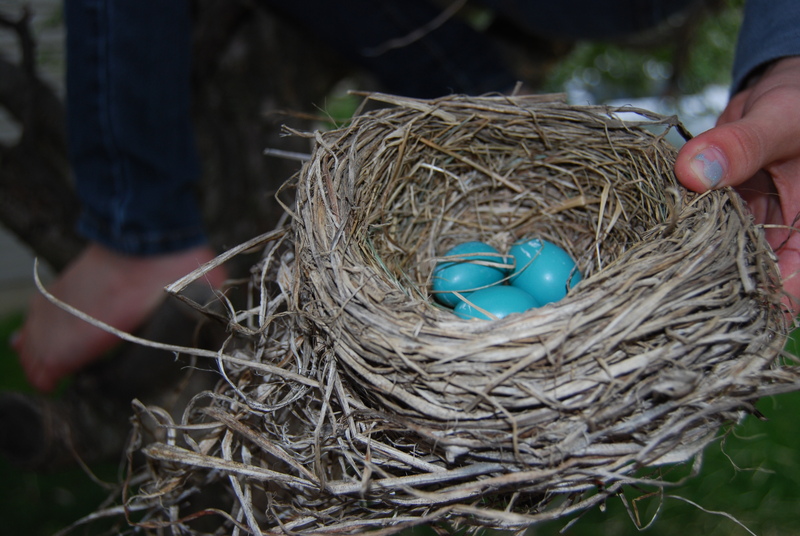 Purple Little Bird by Greg Foley A bird discovers that too much of even a favorite color isn’t quite right. The Purple Balloon by Chris Raschka A sad but gentle tale to introduce young ones to the concept of someone facing the prospect of death. I was really tempted to send this back to the library without reading it to the kids. I finally decided, though, that it would be easier to read it for the first time without the reality looming directly in front of us personally. Lilly’s Purple Plastic Purse by Kevin Henkes A fun story that illustrates how difficult it is to humble oneself when wrong and the blessing of repentance and restoration in relationship that follows. Lunchtime for A Purple Snake by Harriet Ziefert Grandpa walks his young grand-daughter through the process of creating a painting. Sally and the Purple Socks by Lisze Bechtold Creative story about some amazing purple socks with many unusual uses. Lots of purple flowers to spot this time of year. How many kinds can you name? 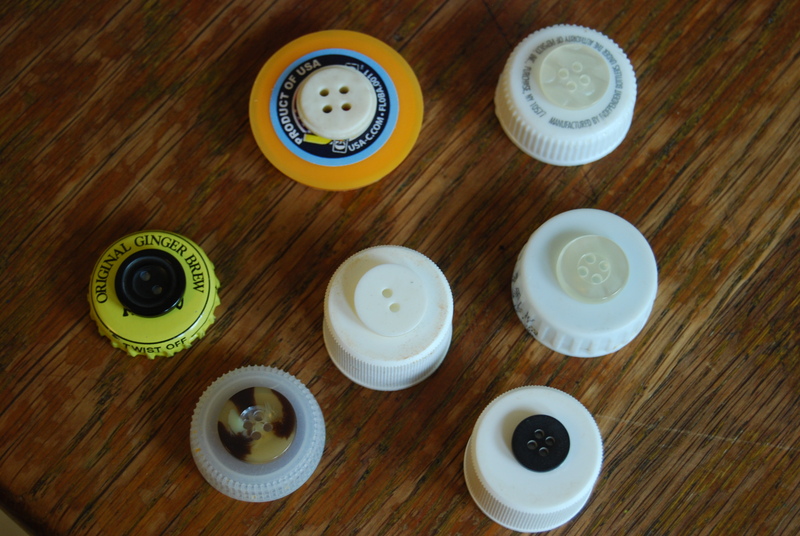 My idea for this project was to make “button stamps.” I’d seen buttons glued onto corks to make stamps and thought we could replicate that. I didn’t have any corks, but I did have a bunch of bottle caps. 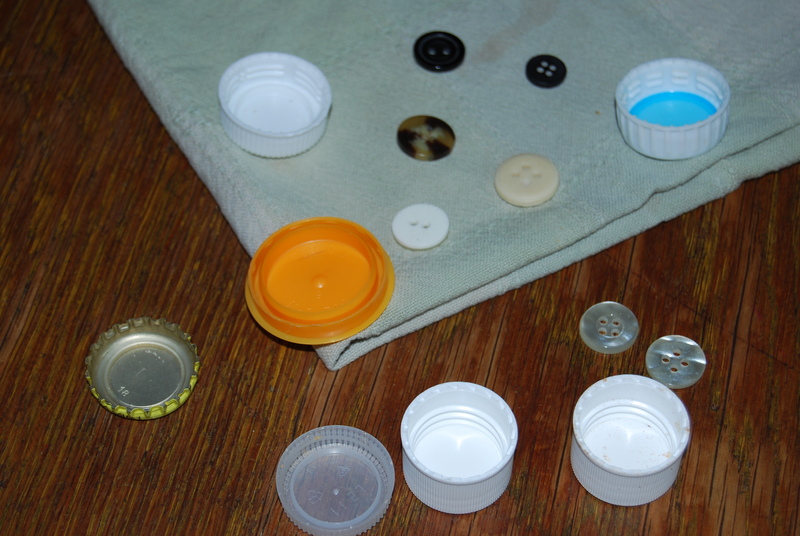 I glued the buttons to the caps and let them dry. Unfortunately, white glue does not do a good job of adhering plastic to plastic. 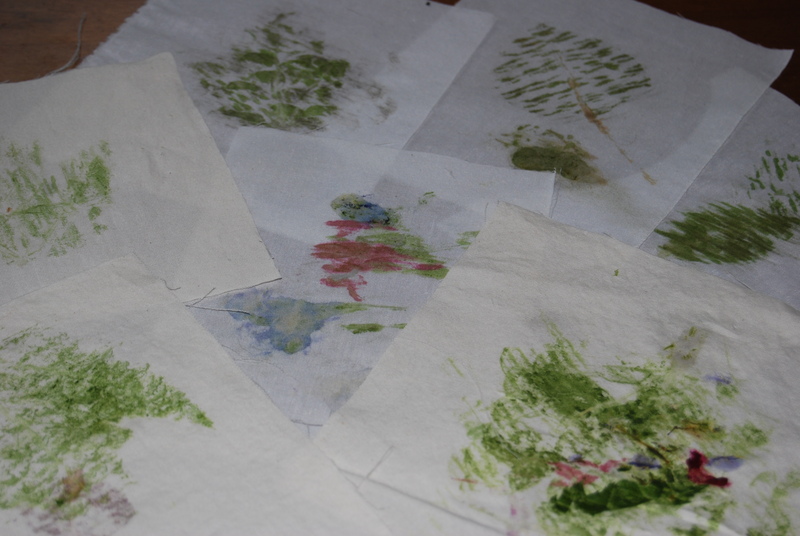 The buttons that weren’t immediately picked off by little fingers quickly succumbed to the suction of the paint on the paper! 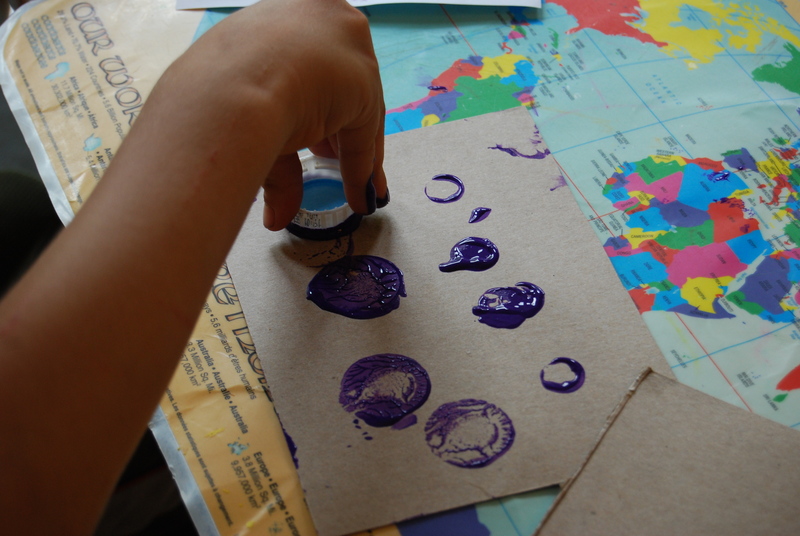 Thankfully, it was just as fun to dip the caps themselves into the paint to make circles. Categories: Homeschool, Preschool, Projects | Permalink. 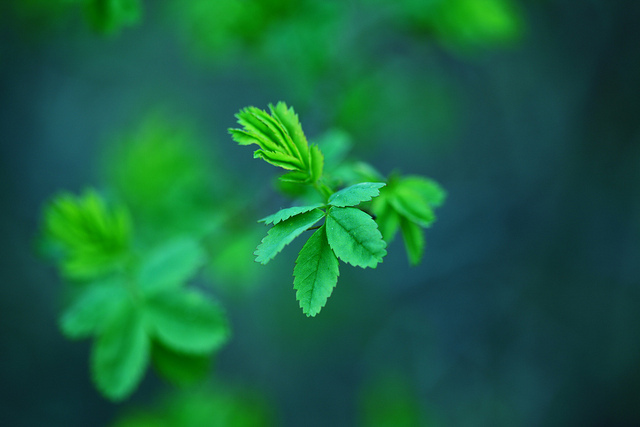 Since we are in the middle of spring we are surrounded by wonderful growing greenery of all shades! When I am asked what my favorite color is I usually settle on green. 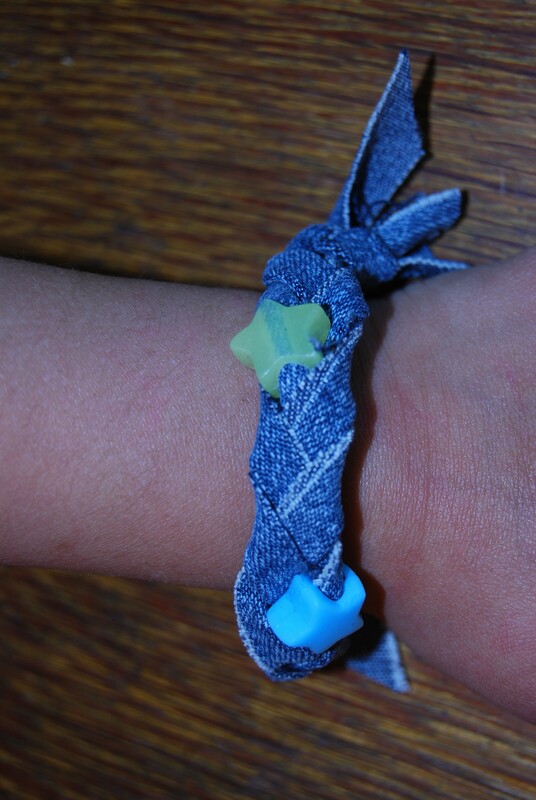 It is nice by itself, but it also accentuates all the other colors nicely. GREEN BOOKS – These seemed to be in short supply both on my own shelf and in the library. In addition to the few listed below we checked out books on green frogs and green lizards. Green sea turtles would be another option. Verdi by Janell Cannon Fun story of a young python’s growing pains. Green Eggs and Ham by Dr. Seuss A classic of course! None of my kids are fans of eggs dyed to a green color, but a quiche stuffed with kale or spinach that’s been finely diced in the food processor and sautéed with onion, salt and pepper suits them just fine. 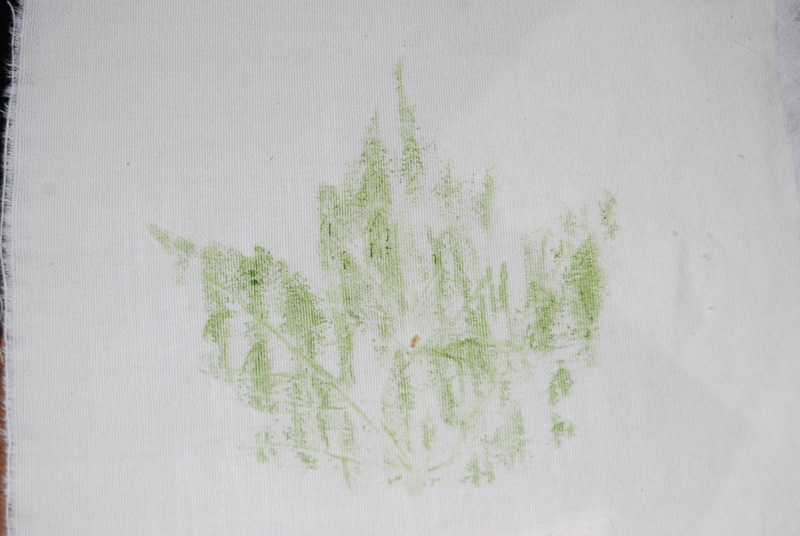 Green by Laura Vaccaro Seeger A beautiful book that illustrates numerous shades of green in the world; small cutouts on some pages incorporate a portion of one painting into another. The Giving Tree by Shel Silverstein Has a lovely green cover! GREEN FOODS are abundant. I could begin naming them, but the list would quickly get overwhelmingly long. Since we already eat green foods on a nearly daily basis I decided to make a treat out of this dip to eat with green, i.e. Granny Smith, apples. Combine all ingredients and mix well. Enjoy with apples of your choice. Amount of honey used would probably vary depending on the sweetness of your apples. **Greek yogurt will work if you don’t want to make yogurt cheese. Cream cheese could also be used, but you may need to thin the dip with some milk. 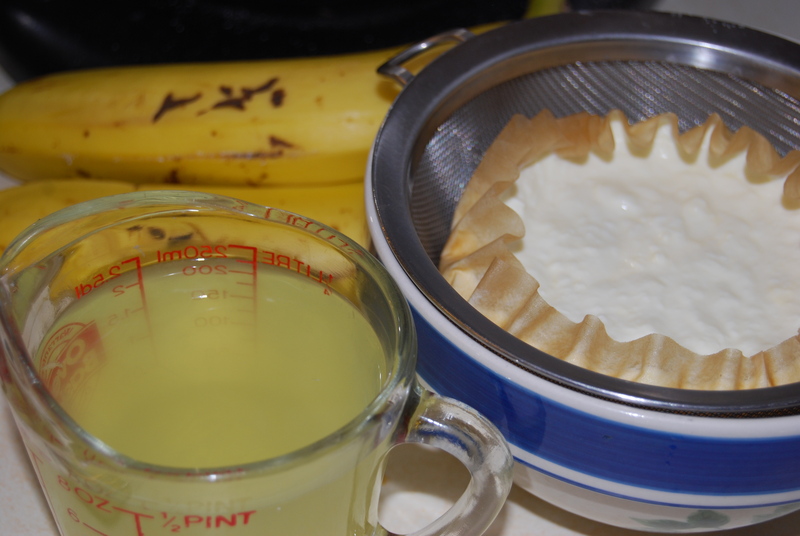 If you do want to make yogurt cheese, line a fine mesh strainer with a coffee filter and place over a bowl. Fill strainer/filter with about 2 cups plain, unsweetened whole milk yogurt. Allow to sit for a couple hours until a cup or more of whey has been strained off. You will need to pour the whey out of the bowl periodically if it is not large enough to keep whey level below strainer. Use the remaining thick yogurt “cheese” for your dip. Don’t throw that whey out! 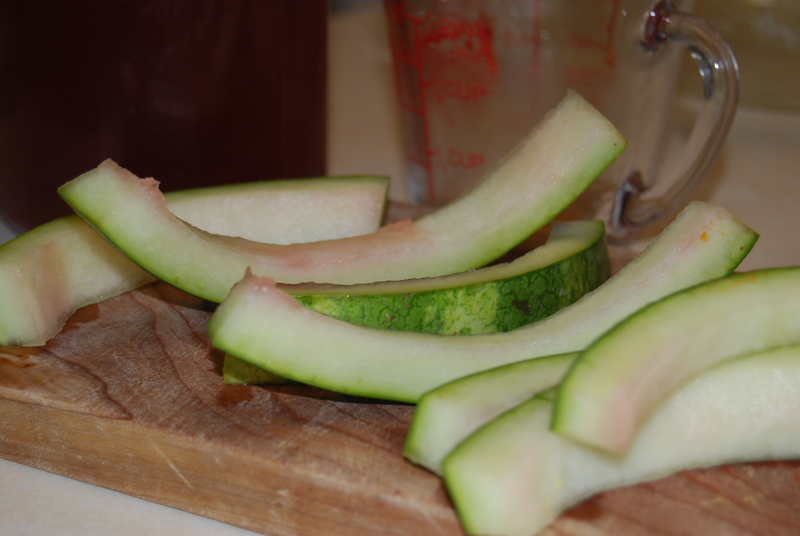 Use it as a base for a smoothie or in place of milk or water in any pancake or bread recipe. My bread (either sourdough or yeast risen) always turns out best when I use equal portions whey and water for the liquid. We used various greenery (and a few flowers) collected from the yard to create plant poundings. The kids loved using the hammers! We placed the plant pieces on sheets of corrugated cardboard, placed the fabric squares over the plant pieces and pounded away. Everyone was happy with their creation regardless of wether the full impression of the leaf came through clearly or their efforts simply resulted in a lot of green circles! 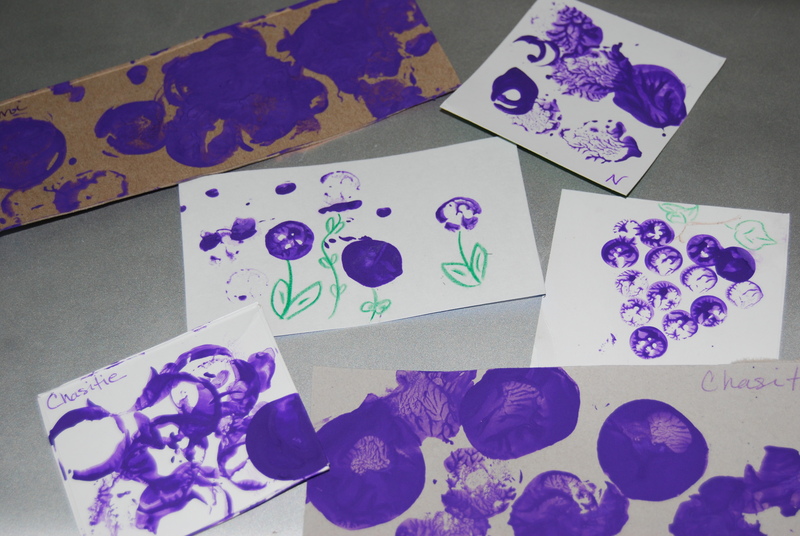 Since Mother’s Day was approaching, we used the results to create cards (that I neglected to take pictures of). What state is known as The Green Mountain State and why? The Green River What state(s) does it go through? 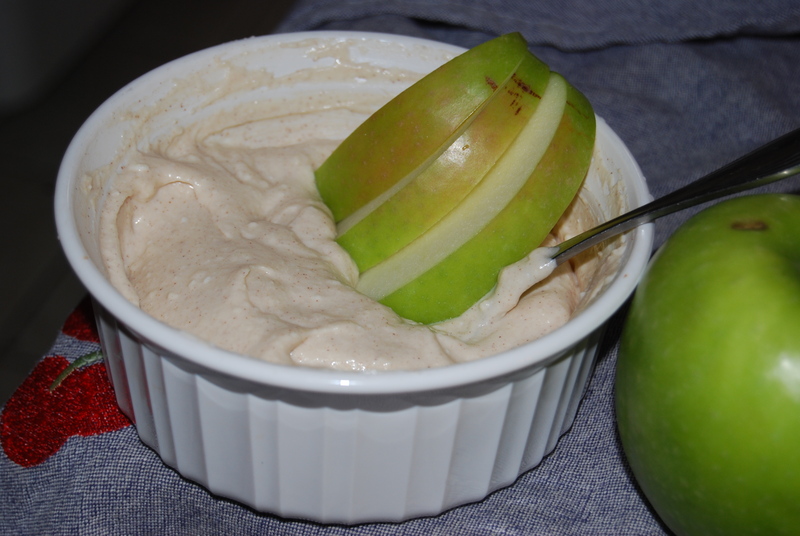 Categories: Edible, Homeschool, Preschool, Projects, Recipes | Tags: apple dip, plant pounding | Permalink. 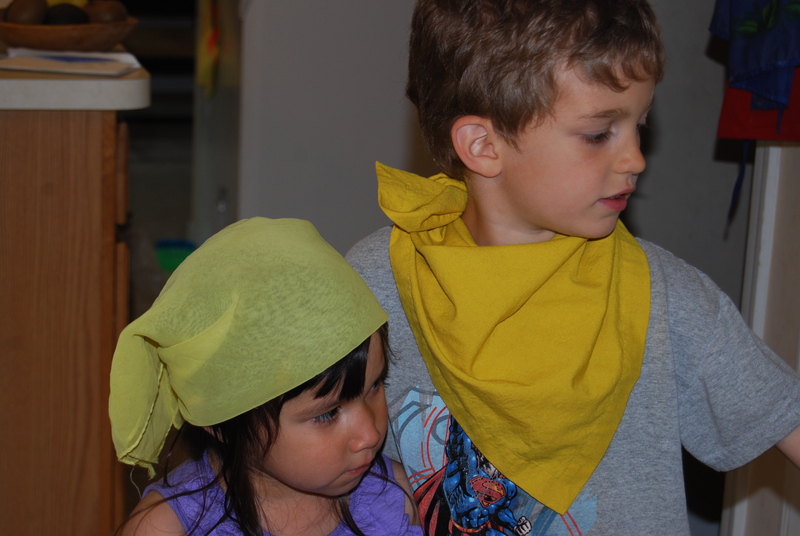 The kids found a few yellow accessories to model. 2/3 cup organic crystallized cane juice (sugar); you could also use rapadura or maple syrup, but the lemonade won’t be yellow! Macerate sliced lemon in sugar in the bottom of your pitcher. Let the kids squish it around really well (a potato masher works great) to release all the juice and start dissolving the sugar. Add lemon juice and mix well to continue dissolving the sugar. Add water and mix again. Fish out all the lemon peels and seeds if you wish and serve. 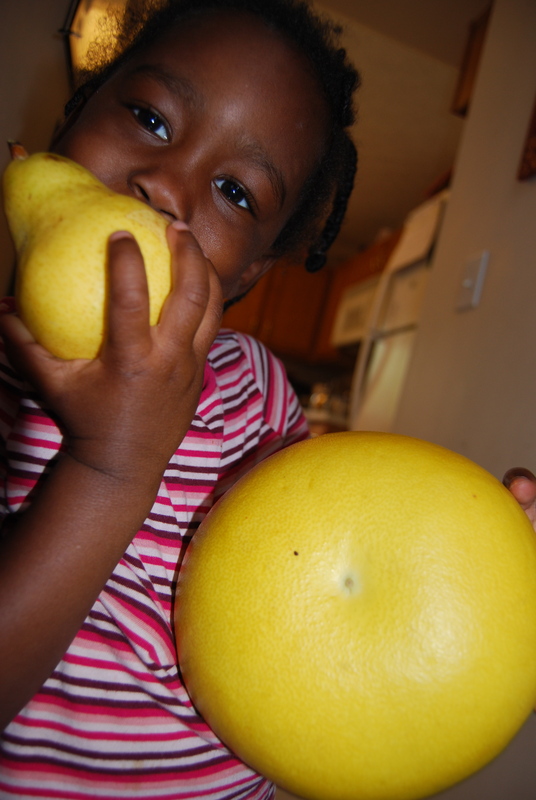 Other YELLOW FOODS included pears, yellow squash and peppers, pineapple and pomelo–if you’ve never tried one, please do; they taste like sweetened grapefruit juice! Our YELLOW OBSERVATION WALK turned up a few flowers, road signs and school busses. Curious George by H. A. Rey George may not have come to us without the “big yellow hat”! Red and Yellow’s Noisy Night by Josh Selig Short story about considering others and mutually beneficial compromise. In My New Yellow Shirt by Eileen Spinelli A young boy’s imagination lets him experience many “yellow” adventures. Yellow Umbrella by Jae Soo Liu An unusual wordless book accompanied by an enjoyable instrumental CD. Little Blue and Little Yellow by Leo Lionni The story that started Mr. Lionni’s writing career! The Little Yellow Leaf by Carin Berger One leaf joins another to encourage it on it’s new adventure. One Yellow Lion by Matthew van Fleet Fun, colorful counting book; good for guessing on the first read through and remembering on subsequent reads. 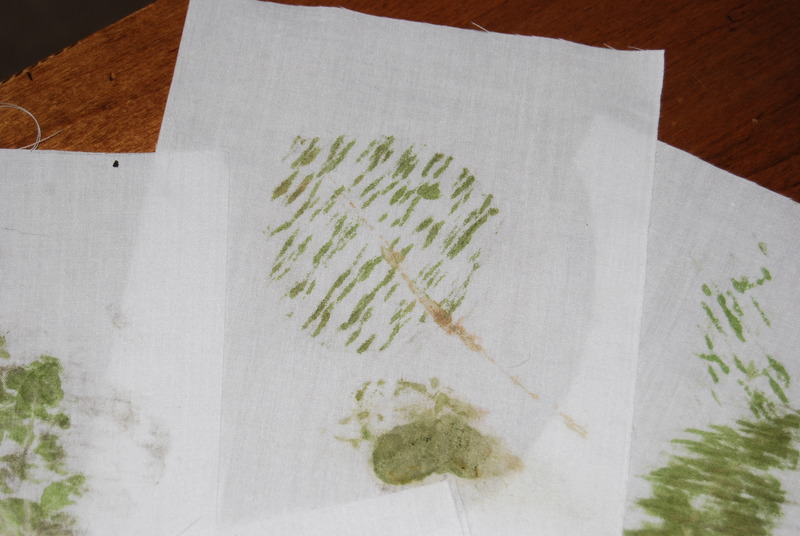 Potato prints and apple prints may be common . 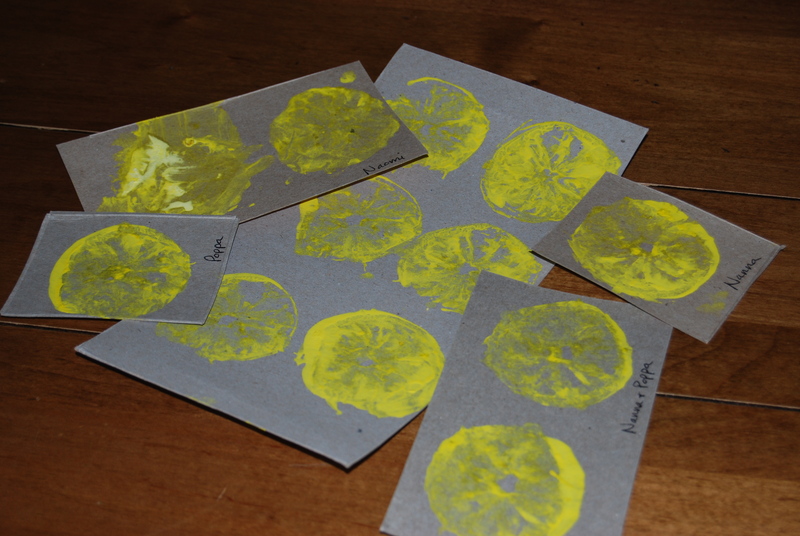 . . we made lemon prints. These were very simple and a lot of fun. 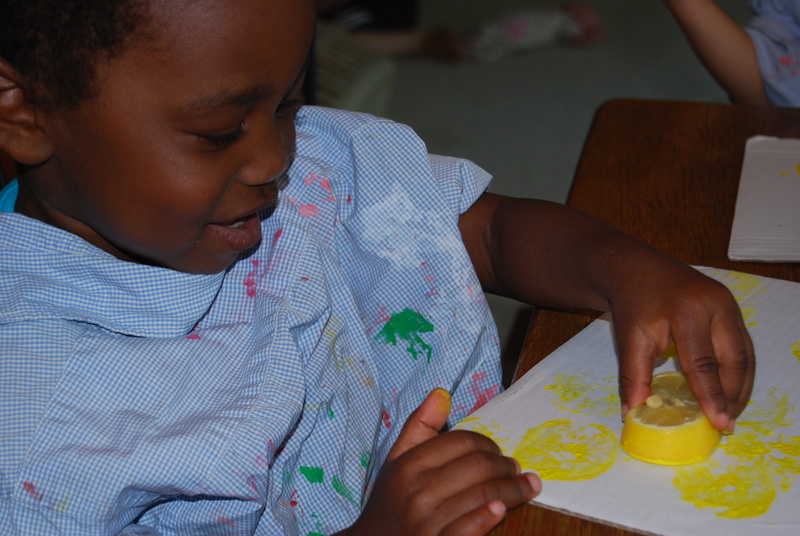 One thing about kids and art is that if they really like the project they want to make another . . . and another . . . and another . . . and soon we run out of paper! For some reason I had a stash of small pieces of cardboard saved from the sides of thin cardboard boxes (kleenex, tea, etc.). 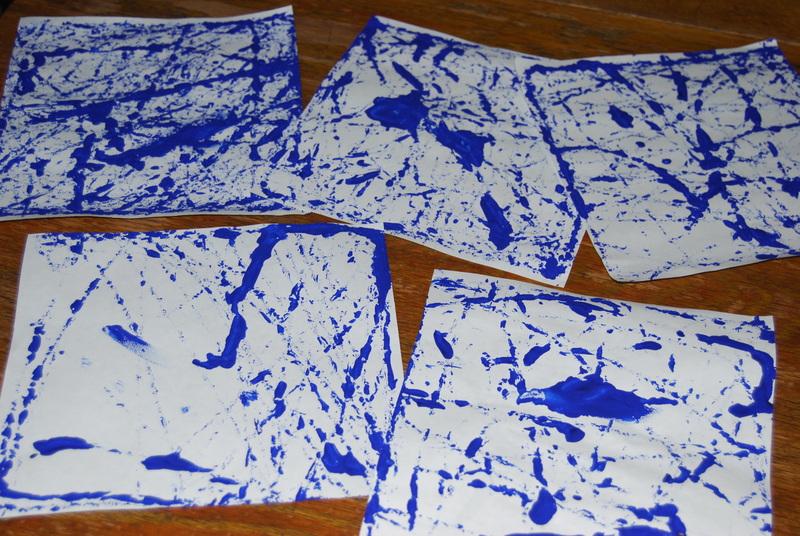 These made great, sturdy art boards that took paint well. I will be sure to keep recycling these treasures in the future! Yellow Fever Yellow Death: A True Story of Medical Sleuthing by Suzanne Jurmain Fascinating reading about the team who worked in Cuba to determine the cause and cure for a mysterious disease. An extra YELLOW PROJECT (some say that yellow makes one hungry . . . apparently it made us creative!) 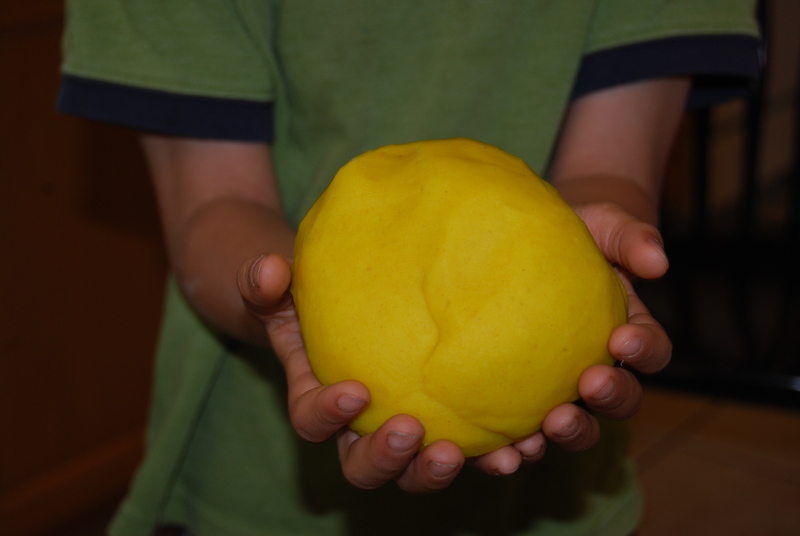 was making naturally dyed yellow play-dough. Measure first 4 ingredients into medium, thick bottomed pan. Mix briefly to combine. Combine water and oil and pour into dry ingredients. Cook on medium heat, stirring with a whisk to get out all the lumps. It will thicken as it cooks; you may need to switch to stirring with a wooden spoon. It is finished cooking when it all stirs together into a lump. 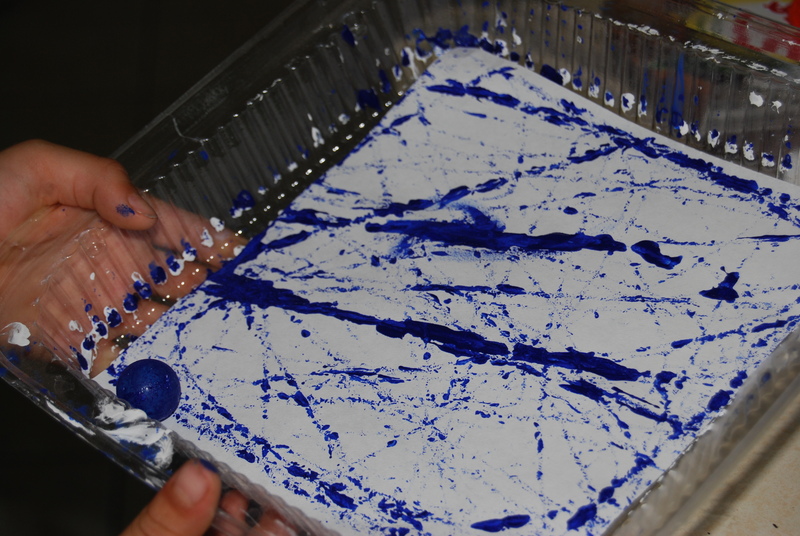 Remove pan from heat and dump play-dough out onto a sheet of wax paper, parchment paper or foil. Carefully knead the play-dough (it will be very hot–I like to use something under it that is large enough to fold over the top and make it slightly easier to touch) to remove any remaining lumps. Divide among the kids when cool enough for them to handle. Recipe will double easily. Store in an air-tight container or zippered bag. *Don’t be tempted to skip this unless you want moldy play-dough! It has a preserving effect and will allow you to store the play-dough for months. 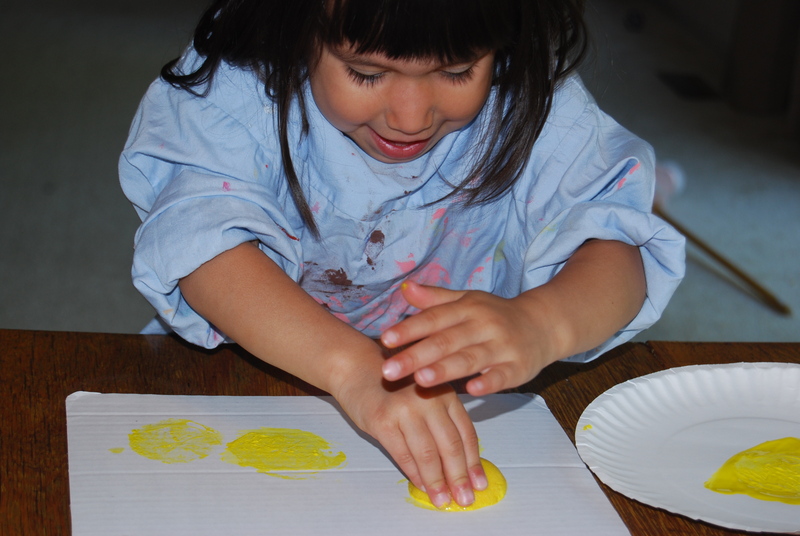 **Turmeric is a ground spice that naturally gives the play-dough a dark yellow color. I don’t think the turmeric stained anyone’s hands or clothing, but it will leave a yellow stain on your counter if you spill it there. A couple days’ worth of washing the counters will remove it. Another natural alternative is to soak a few saffron threads in the water before adding the oil; remove them before adding the oil and mixing with the dry ingredients. 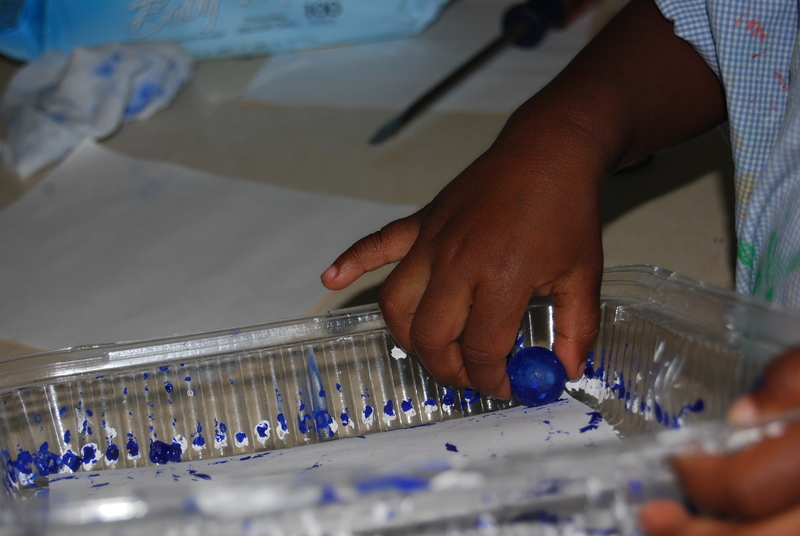 If you want to color your play-dough with ordinary food coloring, add it to the water and oil mixture rather than the dry ingredients. 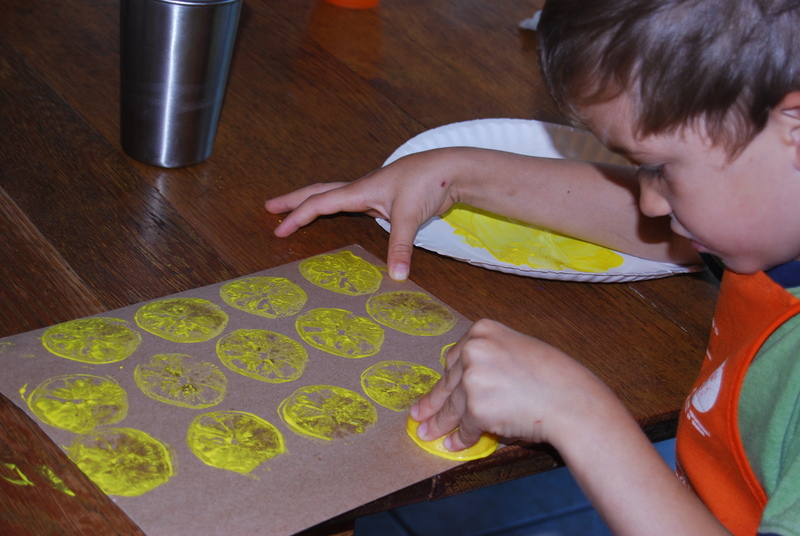 Categories: Homeschool, Preschool, Recipes, Reviews | Tags: lemon print, lemonade recipe, natural dye for play dough, play dough, playdo, recycle craft | Permalink. Chasitie (age 3) – Lucky Ducklings by Eva Moore. Charming illustrations in a fun, true story about the near demise of a family of ducklings. Naomi (age 3) – Who Put the Cookies in the Cookie Jar by George Shannon. Simple text and colorful illustrations show how much work really goes into eating a cookie. 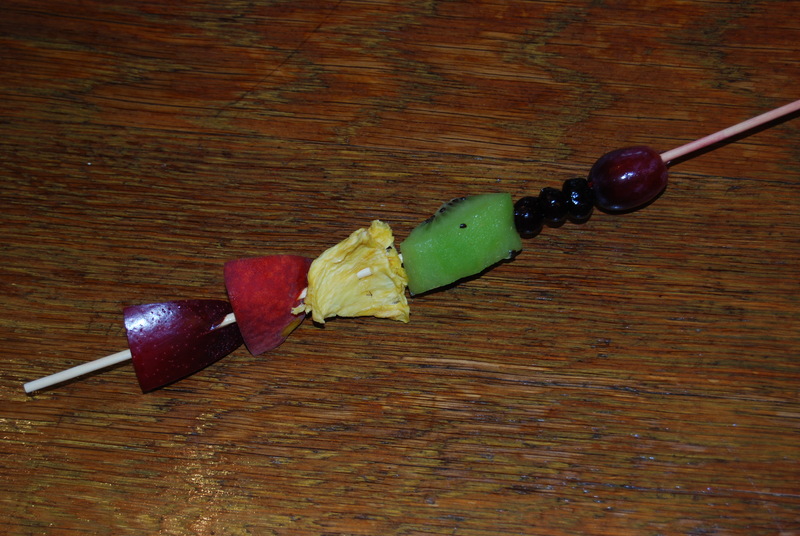 Andrew (almost 6) – Winnie-the-Pooh by A. A. Milne. Even the big boys haven’t been able to stay away when I’ve read these stories of imagination and adventure out loud. 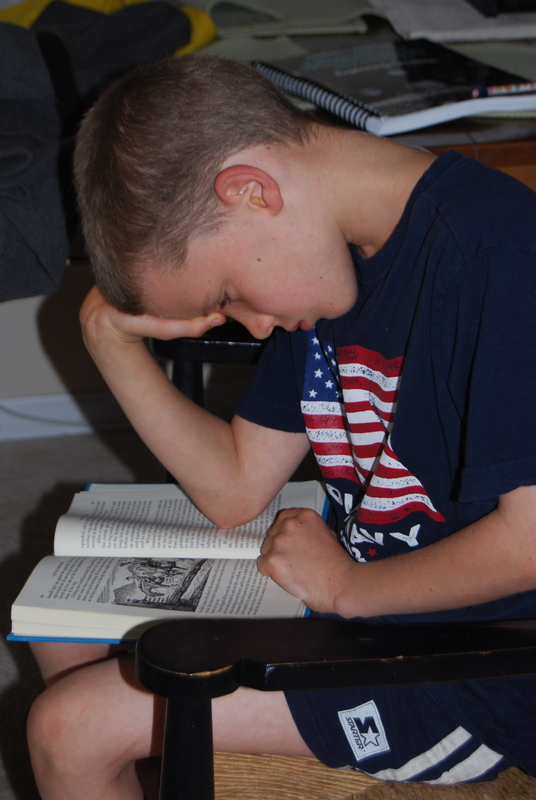 Jonathan (age 9) – Salamandastron by Brian Jacques. This is the 5th book in the Redwall series–full of beautiful scenery, colorful characters and valor. Considering there are more than 20 in the series, I’m thankful our local library is well stocked! 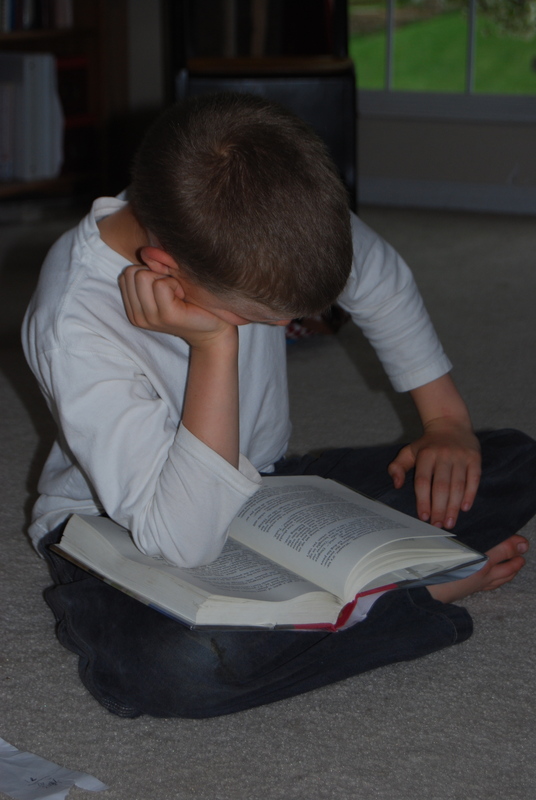 Samuel (age 9) – North Or Be Eaten by Andrew Peterson. This is the 2nd book in the Wingfeather series–intriguing, adventurous and suspenseful; full of honor and integrity. Abi (Mom) – Tuttle’s Red Barn by Richard Michelson. Wonderful narrative of the Tuttle family and how they’ve kept their farm in Dover, New Hampshire working through 12 generations. As a farm girl born in Dover, I was delighted to find this book. It’s not just New Hampshire history; it’s American history. Mary Azarian’s woodcut illustrations complement the story beautifully. Harrison (Dad) – Since Samuel already picked North Or Be Eaten . . . How To Argue Like Jesus by Joe Carter and John Coleman. The authors do a good job of explaining different types of argument and illustrating how Jesus employs these methods to convey truth to His audience. The unique thing about orange is that it is a fruit, a flavor and a scent in addition to being a color! As a color orange is certainly not as prevalent as red, but we still managed to find quite a lot of it around us. 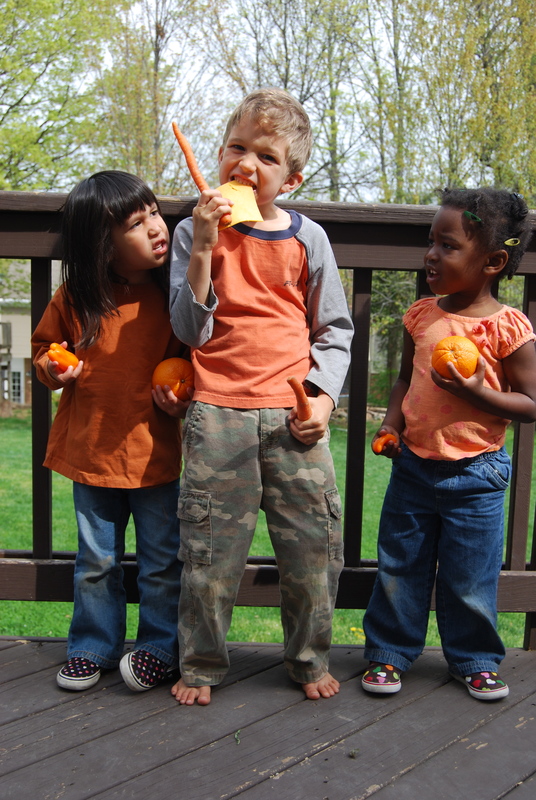 A few of the kids did manage to WEAR orange! 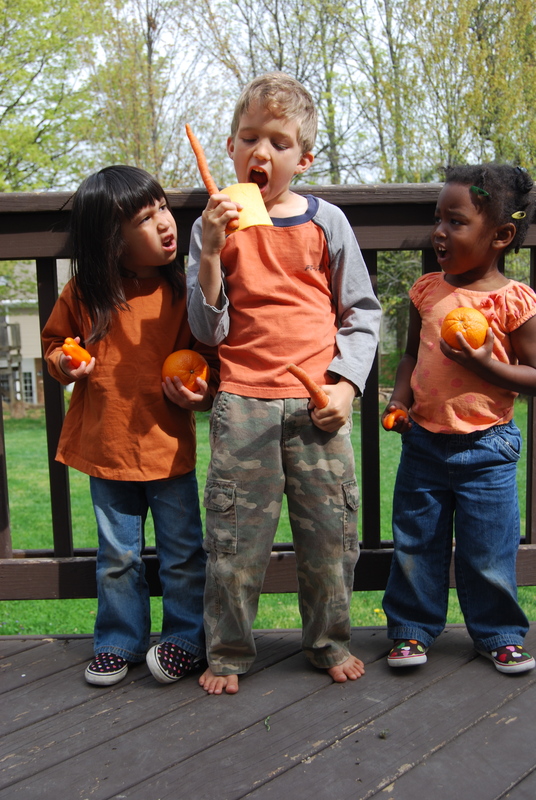 An Orange in January by Dianna Hutts Aston A neat story that starts with the orange trees blossoming and ends with kids sharing an orange. Orange Pear Apple Bear by Emily Gravett A silly board book that Naomi especially liked. Each Orange Had 8 Slices by Paul Giganti, Jr. A fairly advanced counting book (more like advanced addition or multiplication). Definitely created my own text for the little kids. A Star in My Orange by Dana Meachen Rau A unique shape book. An Orange for Frankie by Patricia Polacco A christmas story for the big kids that made me cry (as many of this author’s books do)! The Pumpkin Patch Parable by Liz Curtis Higgs It may be spring-time, but . . . pumpkins are orange! Too Many Pumpkins by Linda White Again, more fitting for fall reading, but probably my favorite pumpkin story of all. Mop Top by Don Freeman The only thing orange about this book is the illustrations; great story about a boy who doesn’t want a haircut. Sam and the Tigers by Julius Lester A modern re-do of “Little Black Sambo” that my kids love; the tigers, of course, are orange. The Carrot Seed by Ruth Krauss A boy’s patience and diligence are rewarded when he refuses to be discouraged by those around him. 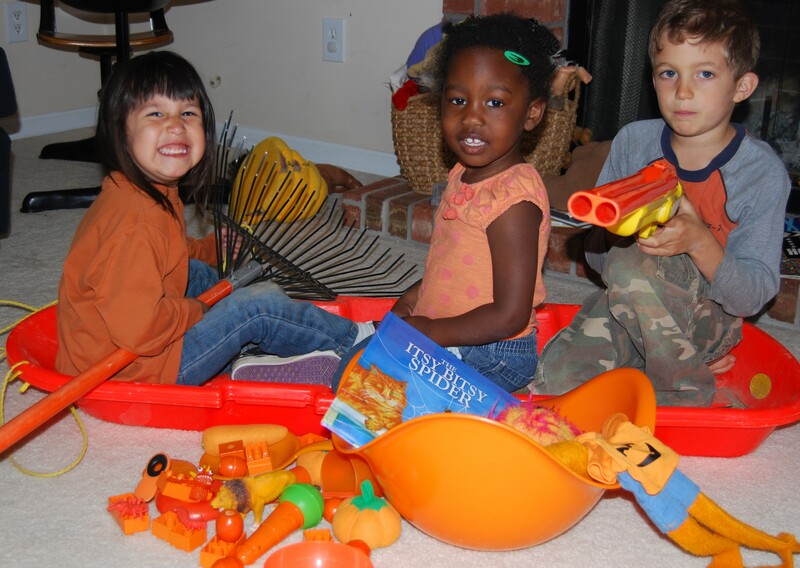 We did manage to find a number of orange toys and various objects around the house. If you have trouble finding much orange around your house, check the garage! You may not want to cart those things into the house (we left the bike, extension cords and chainsaw there) but it may be good source of orange treasure. Orange balloons were the prize of the week when everything was returned to its proper place. Doing this one in the fall may seem like a better idea, but the scarcity of orange objects around made the few discoveries even more exciting. We also saw a surprising number of orange cars and trucks out on the road this week! Carrots – how many ways can you eat a carrot? Try this slaw recipe if you don’t like the standard shredded carrot, mayo, raisin salad. 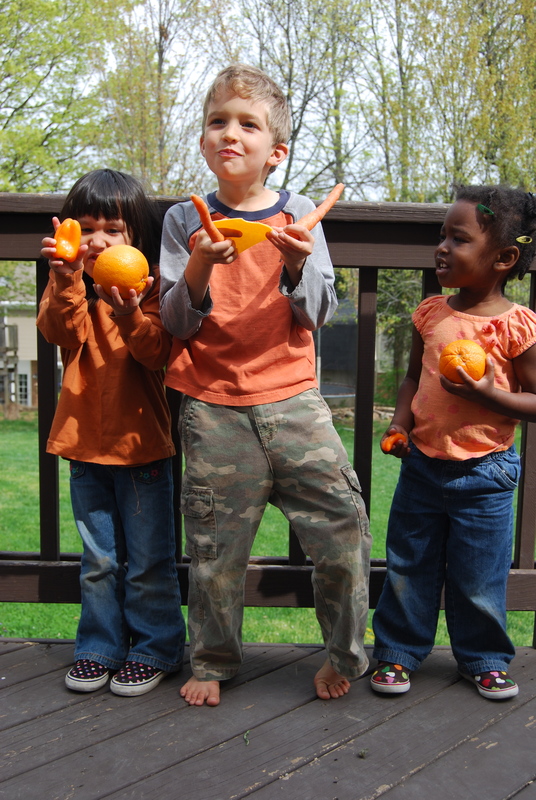 Oranges – how many ways can you cut an orange? If its rainy or cold and you want to bake try pumpkin bread or carrot muffins. 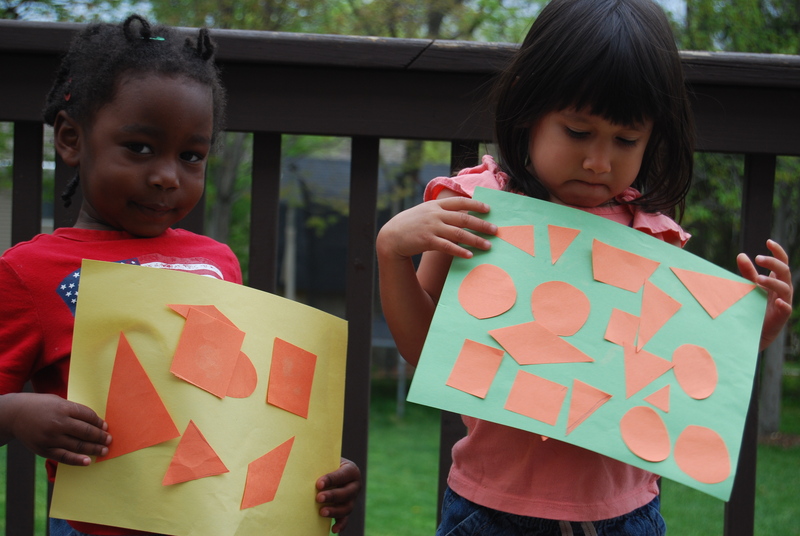 The orange crayons, markers and pencils certainly made their appearance, but we kids also made some shape collages. Plant some carrot seeds (remember that they really do take a long time to sprout!) or pumpkin seeds. Marigolds or nasturtiums would work if you prefer flowers. Research the history of Orange County, California. What other states also boast an Orange County and why? I enjoyed reading this novel: One Day and One Amazing Morning on Orange Street by Joanne Rocklin. A mysterious story of camaraderie among neighbors; you may want your kids to be 10 or 12 before handing it to them. Categories: Homeschool, Preschool | Permalink.